Lien Chieh Machinery (LCM) has been developing specialized Hydraulic Presses, Mechanical Presses and Shipyard Presses for many years and continues to develop machinery at the very forefront of the industry. Having passed both CE and ISO 9001 certifications, we are able to manufacture Shipyard Presses and other Hydraulic Presses in line with global industry standards. With the capability to fully customize our Presses, we have earned an outstanding reputation with clients all over the world. We are particularly proud of the partnerships we have formed over the last 65 years and are continually looking for new clients to go into business with. 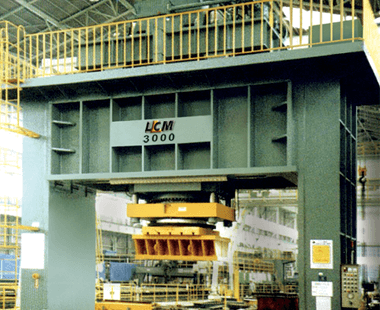 LCM has exceptional expertise in the production of specialized Hydraulic and Mechanical Presses such as the 3000 ton Traveling Ram Hydraulic Shipyard Press installed at a Hitachi Shipyard in Japan. As a foremost Hydraulic, High Speed Press and Press Maker, LCM is leading the way with technological developments and production processes. As we continue to improve the performance, reliability, and efficiency of our Shipyard Presses we are also advancing our after-sales support systems. This will ensure that in the years to come we will keep offering our global customers, the best quality Presses and service imaginable.